Banner stretches across Main Street in Saco. Some people recognize the extended day, the warmth of the sun this time of year or even the birds returning to their homes as a sign that spring is just around the corner. 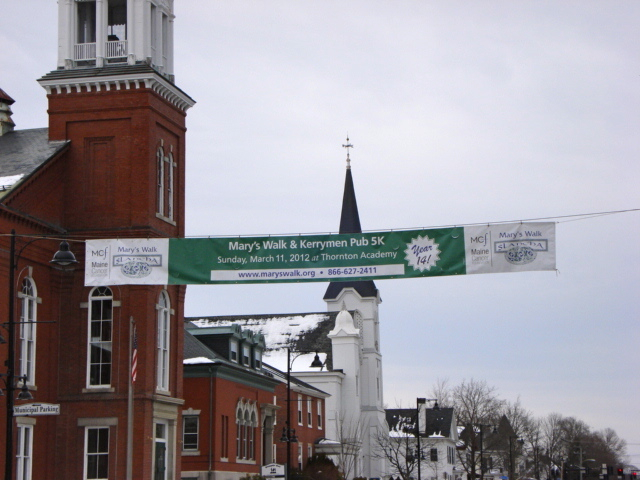 For the people of Biddeford, Saco and Old Orchard Beach, one sure sign is when the banner announcing Mary’s Walk and the Kerrymen Pub 5K Road Race is raised across Main Street in Saco. The walk and run will be held this Sunday afternoon (March 11, 2012) at 12 p.m. at Thornton Academy, and the signs are starting to appear everywhere. There are posters and banners in stores, schools and businesses throughout our community and the event organizers are expecting a big crowd. Gene Libby, a founding organizer for the events, said that there were over 3,000 people at the walk and run last year. All of the funds raised during the event are donated to the Maine Cancer Foundation and earmarked for cancer research that takes place in the state of Maine. Libby proudly said that next year will be the 15th annual event and after that walk and run, the organization will have raised over $2 million to fight the disease. Libby and the others in his group simply asked that people look for the signs and come join the event. “Hopefully, it will be a sunny spring day,” he said.